The smartphone market is almost completely owned by the iPhone and various Android phones. This makes it difficult for a competitor like Nokia, who has bought into the Windows Phone OS, to make a dent as it tries to wrest mindshare and market share away from the incumbents. This problem is only exacerbated by the fact that Nokia also has to compete against the iPhone on price, a topic broached today by The Wall Street Journal. 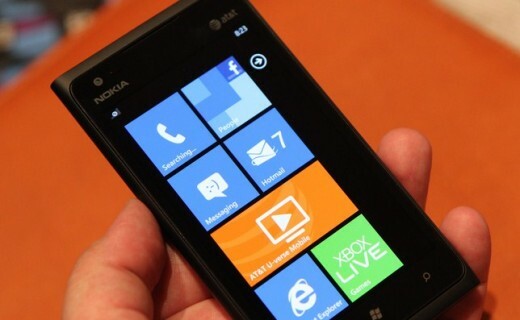 The article focuses on how hard it has been for Nokia to offer its Lumia 900 smartphone at a retail price of $450 — $200 less than the iPhone — while competing with Apple for the components to build it. The story uses component estimates provided by IHS iSuppli, which is sometimes accurate and sometimes not so much, but the basic tale is solid. 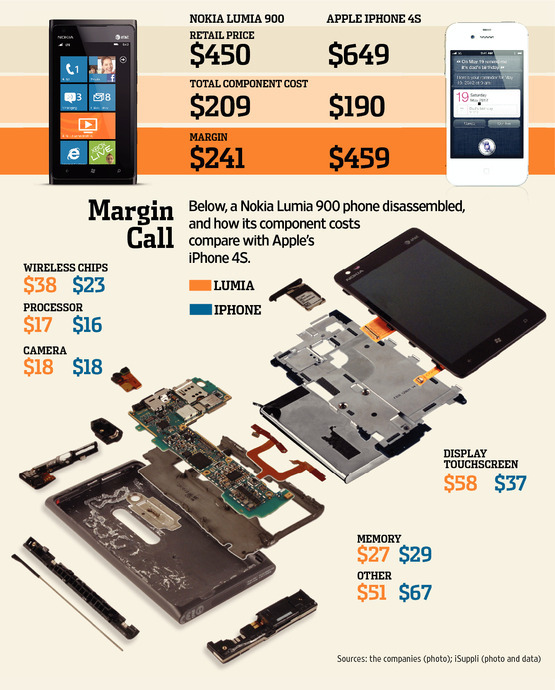 Simply put, Apple makes twice as much on every iPhone sold as Nokia does on each Lumia, largely due to its masterful control over the supply chain. But the answers are far more complex than ‘Apple buys parts in bulk and gets a good price’. The company’s strategy today is the result of a decade’s worth of work to get here. Although market share is easy to quote — and to be sure Android has the lion’s share of the market — it only answers the question of who has planted flags, not who has built a business that is sustainable and generates profit for the company and its shareholders. The way that Apple has fostered its relationships with suppliers and manufacturers over the past few years has led to this moment, a time where products like the iPhone, iPad and MacBook Air are not only made using the best materials and manufacturing processes available in the world, they’re also less expensive to make and generate far more profit than competing devices. The conventional wisdom was that the company’s computers were more expensive because they featured the “Apple tax”, levied on the purchaser due to over-engineering and too much focus on design. Those assumptions were largely wrong, but, like it or not, they’ve dominated talk about the company for the better part of its history. Well, Apple wasn’t deaf to that talk, though it felt as a company that it had the best computers out there and was pricing them accordingly. But instead of shrugging it off as bias, it was building a bankroll and a manufacturing philosophy that would allow it to keep its 30%+ gross profit margin, while maintaining its more expensive and higher quality processes. This has allowed the iPhone to rake in enormous profits for Apple on its way to becoming the most valuable tech company in the world, all while technically being outsold in the market. It’s a fitting testament to the success of Apple’s strategy over the last ten years. This profitability has come from a unique stance taken by Apple in that it takes an incredibly active part in its supply chain and manufacturing. 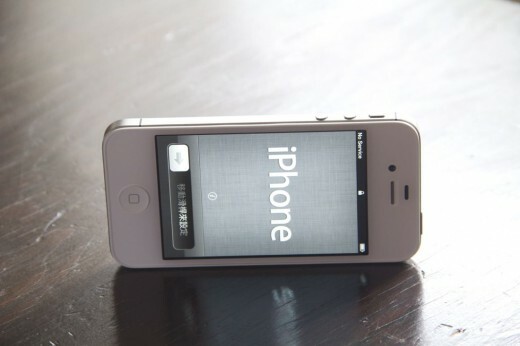 This is largely due to the operations prowess of former COO and current CEO Tim Cook. This attention has allowed it to use its enormous bank of capital to push technology ahead of its normal timeline. When new technologies, like ‘Retina-level’ displays, are emerging on the market, it takes an immense amount of investment to create and perfect them. Therefore any manufacturer who puts the money into building the infrastructure to produce a new bit of technology reliably has a huge bundle of cash to recoup and will attempt to do so by offering the technology on license to others. Apple has reversed this process and instead of waiting for new technology to become available to all of its competitors, has accelerated the process by paying for manufacturers to construct factories, purchase machines, train employees and perfect the process. It takes its repayment in the form of exclusive access to the tech for a given period of time and a discount on purchases for a period of time after that. The bits of technology that allow them to make more responsive touch screens, brighter displays, thinner devices, single-piece aluminum bodies and whatever other factors that differentiate Apple products are also the exact same bits that allow them to make products with a bigger profit margin. Customers will buy products that look and feel more advanced and easier to use, and as they do, Apple reaps bigger rewards than any of its competitors because of its built-in cost advantage. It’s an epic one-two punch. In addition to its price advantage, Apple has the luxury of being able to push its tablet out through its own Apple Store retail channel. This adds an extra few points of margin to every iPhone sold that doesn’t have to have another slice taken off by an outside retailer. It also gives people a psychologically positive environment in which to pick up and play with an iPhone. The mostly enthusiastic and knowledgable staff at Apple Retail Stores and the clean, well designed atmosphere are a far cry from the experience that most people will have when trying out an Nokia Lumia for the first time. Compare handling an iPhone in a sparse, focused and futuristic feeling Apple store versus trying out a greasy bashed up Lumia 900 on a tether in a Best Buy with no sales people anywhere in sight. No comparison. First impressions are incredibly important. Apple’s 363+ Retail Stores gave customers a fantastic first impression of the iPhone and continue to allow Apple to sell it at better margins, without having to make deals that cut into its profit. Out of the two main ‘types’ of smartphones, iOS and Android-compatible, Apple sells the smaller amount of devices. But it absolutely makes the most profit, and it does so on a massive scale. Google itself is making more on the iPhone than it is on its entire Android operation. Nokia surely has its right cut out for it as it re-enters the U.S. market and attempts to surge back from the losses it has suffered in the transition from basic cell phones to smartphones.